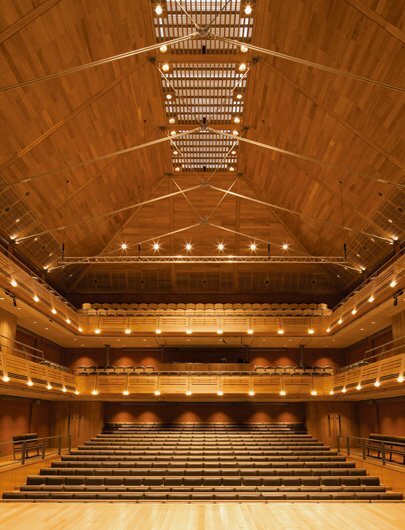 On 27th September 2011 The Apex at The Arc, Bury St Edmunds won a 'Highly Recommended' Wood Award for the Commercial & Public Access Sector. The Apex is a flexible multi-purpose public hall with state-of-the-art acoustics and provides the civic focus for The Arc scheme. The auditorium can be arranged to have a flat floor, or to form a raked theatre or theatre in the round and also houses a cafe, bars and lounge seating. The scheme uses a mixture of American white oak, Siberian larch and European redwood. The judges said: "The auditorium is a real pleasure to be in with the clean lines of the galleries and the splendid timber roof".